I have often thought about investing in a ringflash after seeing that unique, cool look, photographer’s get in the eyes of their subjects accompanied by even shadowless lighting across the face. But that dream was not enough for me to justify the considerable cost of those high end units. Along comes the Vello Ringbox Ringflash Adapter which acts as both a softbox, providing diffused light, and a ringflash for that interesting catchlight in the eyes with minimal shadows. This product easily mounts to your shoe mounted flash, folds up nicely for easy storage into an 8″ pouch, and is available at a fairly reasonable price. For portrait photography, the ringflash is targeted more towards individual headshots and single subjects rather than groups, so I decided to give it a try in my home studio with some willing volunteers. The RingBox comes folded up in a handy zippered pouch much like a small reflector. When you take it out it pops into shape. The image above shows the circular mount for the lens with an elastic draw string web that seats your lens. The rectangular hole at the top is for the flash head. Its a pretty secure mount once assembled. The velcro strip is for plugging up the excess space around the flash head so no light escapes. The interior of the unit is made with silver reflective material to maximize the bounce of the flash exiting the front diffuser panel. The manufacturer recommends increasing your flash by EV +1.5 when in ETTL mode. You will find that you may need to vary that setting depending on your distance to the subject, aperture and shutter speed much like any other shoot. But +1.5 is a good place to start. I did find this tinkertoy type brace rather clever. It’s like a shock corded tent pole with magnets. The Ringbox assembles quickly and your ready to shoot in no time. One material fail that happened right away was this tiny tab (inset image) that snapped off on the first tug. Its function is to keep your cord ends together so as not to allow the strings to come out of the toggle. I had read at least one other review where this had happened. I didn’t think it would happen to me that quickly. The image above is the fully assembled Ringbox. From storage pouch to camera was only a matter of minutes. At first it seems a little cumbersome to sandwich your fingers into the ring to zoom and/or focus, but it really was not all that difficult. The Vello website claims this product is best for portraits and macro use (or close up photography) and will accommodate standard lenses up to 3.9″ in diameter as well as telephoto. For my first few shots I used a 135mm portrait lens and immediately did not like the results. The white balance was all over the place and would eventually take some fine tuning both in camera and later in post. I also saw a slight raccoon eyes shadow cast on my subject’s face. I was about 10 feet from my subject. I deduced quickly I was too far away for the right affect with this product. I switched over to a 24-105mm lens at a focal length of 50mm and moved considerably closer, about 3 feet away. The difference was huge and I started to get a better feel. Skin tones looked much better. Catchlights were nice but small. 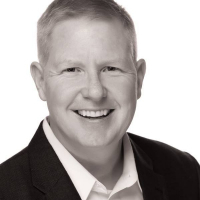 Lighting was even and flat across the face with virtually no shadow against my backdrop. It did give me what I felt was a different and unique look. Now, moving much closer, you start to see those crazy ring shaped catchlights in your subjects eyes. I thought the result was pretty cool. The more I photographed the more fun we started to have with this new toy. A few more examples of my pretty little neighbor and her new pup as she was headed out the door to school (with mom’s permission of course). All my shots were hand held as I like to adjust both focal length and distance to my subject on the fly. This is definitely a light modifier you want to get up close and personal with for unique results. Here is a before/after shot outdoors to show you what a nice kick this ringbox can add to your subject. I found it easy to get used to and received results I liked right away. I particularly like the catchlights along with the overall brightening of the face and eyes. A majority of my work comes from high school seniors and athletes. I love to work with teens as they are always so enthusiastic about being photographed. I can definitely see myself adding this tool to my collection to add yet another “look” to my client’s portfolio. The Vello Ringbox Ringflash Adapter will serve me fine in lieu of the more expensive ring flash, at least for the foreseeable future. I do feel I would prefer to use this item in an indoor studio setting rather than toting it around a park shooting subjects. But I have not yet ruled out giving that a try. The quality seems on par with what you would expect of a small softbox in this price range. Minus the broken tab I saw no issues in the construction. Comments I have read give it favorable reviews with only a few mentioning harsh light, limited usability, or looking silly with a big donut on your lens. I disagree. Any avid photographer can find the sweet spot to make this product give attractive results. Some indicated uneven lighting as a result of the flash not circulating well within the ring. I did not find this to be the case for me. I saw one mention of using this product for medical photography. That got me thinking of the endless opportunities one could come up with where you seek even lighting across the subject; photographing hobbies, home repair projects, products, recording family heirlooms, etc. 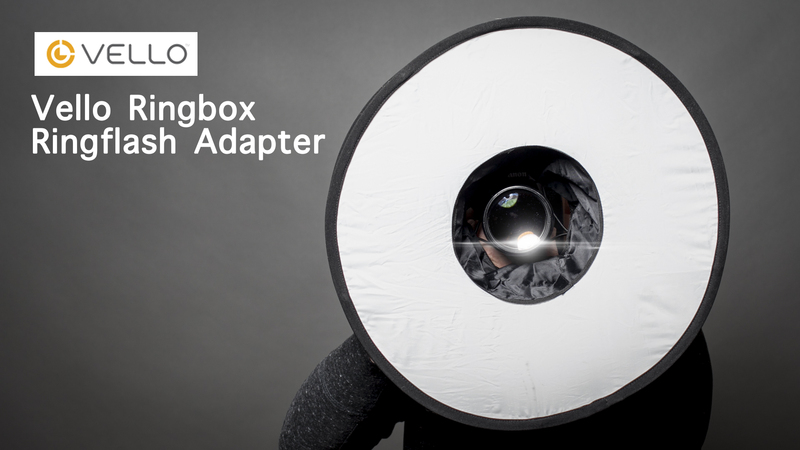 You can find the Vello Ringbox Ringflash Adapter here or visit the manufacturer’s website here. I have a ring flash but find that I prefer a more directional lighting. There is a place for this shadowless and flat lighting but I don’t find it very often. Thanks for your demo. Hi Dan, thanks for the review. In school we had a demo of a ring flash, but never had one to play around with. It is most definitely a unique look that I always loved! You’re right in that this would be an economical way to get that look. I love it!